VFW Post 3838 will hot a special Veterans Wall dedication service at Cape County Park North. Food will be provided. The parade will start in front of First Baptist Church, will proceed up High Street toward the Cape Girardeau County Courthouse, turn left on Main Street and then left on Missouri Street. 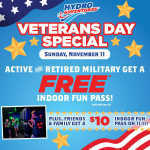 Hydro Adventure's Veterans Day Special! Alex Beaird will play in Keller's from 4 p.m. to 8 p.m. Come enjoy great music!